Asparagus season in the UK very short, going from only May until June. Of course, these days we are no longer a slave to the seasons and can have fresh asparagus that has been grown in Peru or Kenya whenever we like. I love the stuff, but I do feel that our food loses some if its magic when seasons no longer matter. It is for this reason I only buy British asparagus. Asparagus has been eaten in Ancient Egypt, Greece and Rome and has been loved in France for many centuries, and it is the carefully cultivated and selected French type of asparagus that made its way to Britain in the seventeenth century, a time of great ‘vegetable improvement’, and it is still grown here today. This does not mean that prior to this date we did not eat it or try to cultivate it. The etymology of asparagus is interesting – many people think that it was called sparrow grass, but the upper class thought it a vulgar term and subtly changed its name to asparagus to make it sound more posh. This is not quite true: it actually began life as asparagus coming from Mediæval Latin, then it was shortened to sparage in Late Old English and then further modified to asperages in Middle English. It was anglicised to sperach or sperage in the 16th century, but strangely it was officially spelled as asparagus to be in line with Latin. 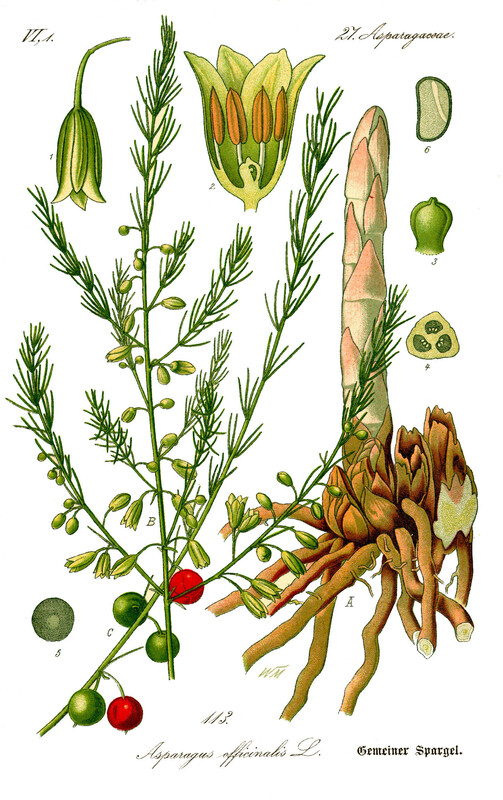 The word asparagus became associated with “stiffness and pedantry”, and the “folk-etymologi[s]ed” sparrow grass arose in reaction to these Latin throwbacks. 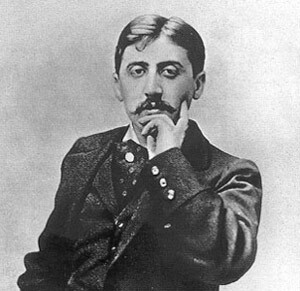 All this information came from the wonderful Online Etymological Dictionary. I love the Old English word – eorðnafela – sounds like some kind of elf queen from a Tolkien book. [Asparagus] cause a filthy and disagreeable smell in the urine, as everybody knows. …all night long after a dinner at which I had partaken of [asparagus], they played (lyrical and coarse in their jesting as the fairies in Shakespeare’s Dream) at transforming my chamber pot into a vase of aromatic perfume. The chemical in question is called asparagusic acid, though not everyone has the ability to produce it (though most do) and not everyone has the ability to smell it (though most can). It is very straight-forward to prepare asparagus. You first need to remove the woody part at the base of the stem. You can do this with a knife, but this involves guess-work, so it is easier to break the spears one at a time because they have a natural snap point where the woodiness lessens. You can trim the ends of course if you want to be fancy. If you have very thin young spears, you may not have to snap them at all. Along the stem of the plant there are strange little leaves that lie flat against the stem; you can remove these if you like, but I tend not to unless the spears are particularly thick. Asparagus needs little cooking: just a few minutes steaming is required. Traditionally it is cooked in a tall asparagus pan so that the spears can be boiled upright. 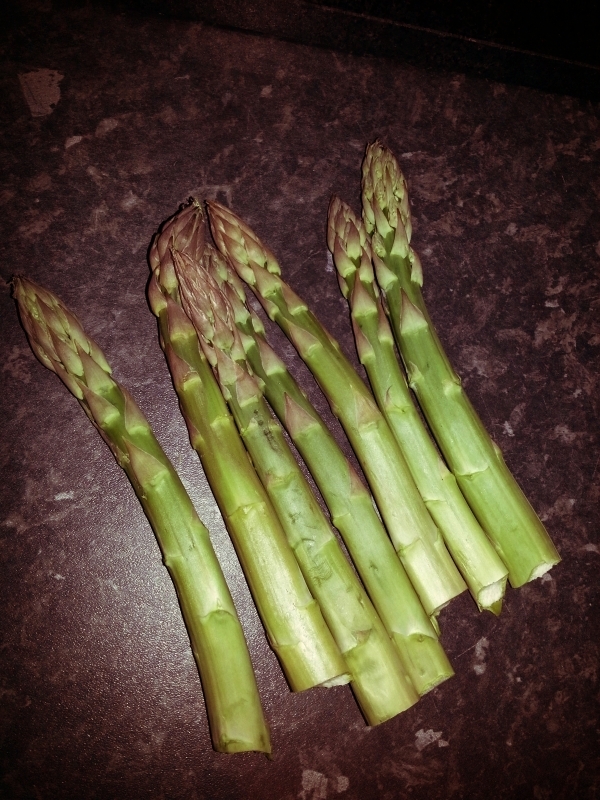 Here’s how I like to cook mine – it shows off the flavour of asparagus cooked simply. Prepare your spears and place them in a pan in just a few millimetres of salted boiling water. Cover so that the asparagus part-boils and part-times. Check if they are cooked by probing the thickest part of a spear – it should be nice and tender. Asparagus spears of a middling thickness will take no longer than four minutes, and will most likely be done in three. Once cooked, Remove the spears and keep them warm, whilst you return the pan to the heat and whisk in a few cubes of butter and reduce to just a couple of tablespoons. Season with salt (if needed) and black pepper. 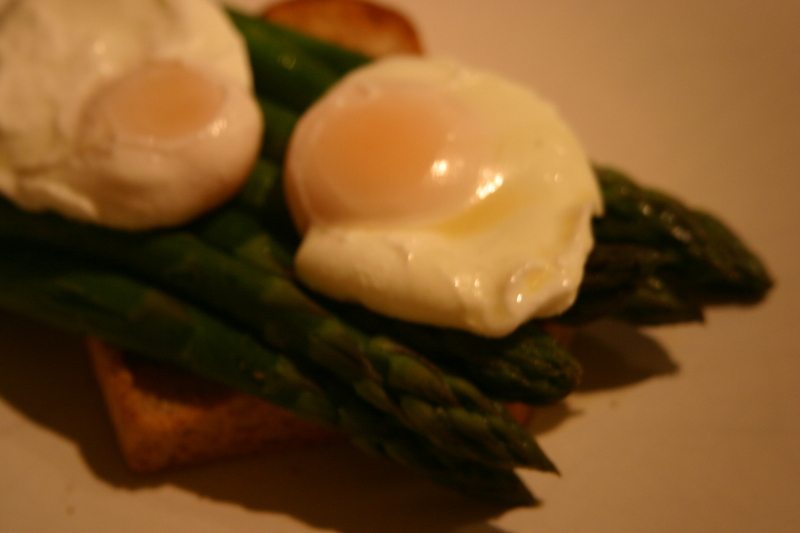 Serve on toast with some of the asparagus-flavoured butter and poached eggs.